A Century of Progress International Exposition was the name of a World's Fair held in Chicago from 1933 to 1934 to celebrate the city's centennial. The theme of the fair was technological innovation. The fair's motto was "Science Finds, Industry Applies, Man Conforms." The architectural symbol was the Sky Ride, a transporter bridge perpendicular to the shore on which one could ride from one side of the fair to the other. 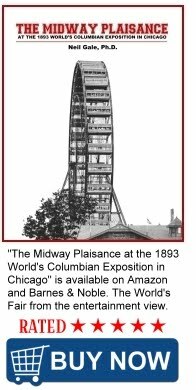 The Sky Ride was designed by the bridge engineering firm Robinson & Steinman, that ferried people across the lagoon in the center of the fair. It was demolished after having carried 4.5 million riders during the run of the fair. The Sky Ride had an 1,850-foot span and two 628-feet tall towers, making it the most prominent structure at the fair. Suspended from the span, 215 feet above the ground, were rocket-shaped cars, each carrying 36 passengers.